Now through April 15, pre-order the Brook Fighter Ball and Dustwasher Kit and receive 10% off a Sanwa series joystick lever while supplies last. This includes Sanwa JLF-TP-8YT, Sanwa JLF-TP-8Y-SK, Sanwa JLF-TPRG-8BYT-SK Higher Tension Silent Microswitch Joystick, and Sanwa JLFD-TP-8YT Detachable Joystick Lever currently on pre-order! Note: Offer is good for one (1) unit of Sanwa JLF series joystick lever per order. Multiple units of balltop will not stack discounts. Brook, a brand known globally for its reputable family of Super Converters and multi-console PCBs, offer something a little different for fighting game enthusiasts: The Fighter Ball. The Fighter Ball and dustwasher is lovingly cut from Rosewood or Beechwood material. No two balltops or dustwashers are alike, due to the unique characteristics of the wood grain. Underneath each balltop is a copper nut to hold the balltop in place on your Sanwa or Sanwa compatible balltop shaft. Each element has the Brook logo etched onto it. The aesthetics of Fighter Ball are one of a kind, but Brook made certain to address concerns about gameplay. Each balltop is coated with a special material to reduce slip while playing, allowing you to keep a proper grip during a match - whether you're hitting the local scene or participating in a national tournament. Each Brook Fighter Ball is housed within a uniquely shaped enclosure. Given the variety of wood patterns and its showpiece case, you may find collecting them is hard to resist. 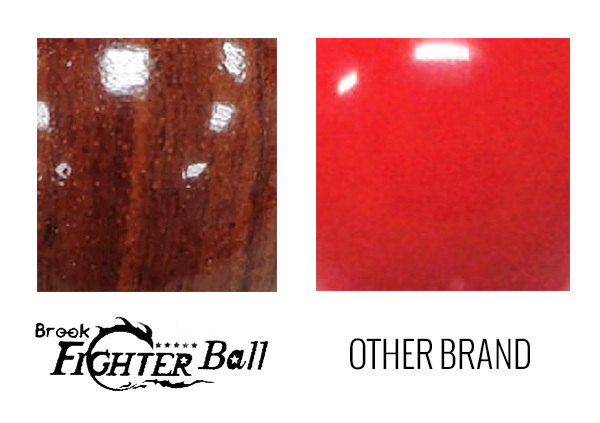 Thankfully the Fighter Ball has an accessible price, especially compared to some similar wood balltops of the same materials. Overall, the Fighter Ball is a nice package, perfect to complement a stylish Fightstick design.